On my visit to our projects in January this year I met these school girls. They desperately didn’t want to get married, but their parents did not have the money for the secondary school expenses. The only option now offered by their parents was marriage. 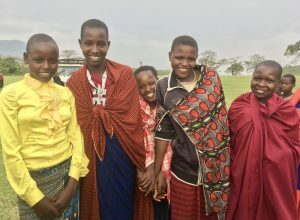 We were all very concerned about this, and after discussion with the girls and their parents, our staff, trustees, community, the Pastoralist Council we agreed to fund all of these girls between us, and all other girls who have passed the secondary exam, but do not have the money for the expenses. One of these other girls was Amani. 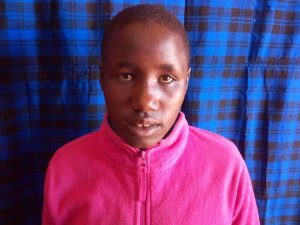 She was also due to be married because her parents did not have a cow to sell to cover her secondary school expenses. Amani so much did not want to be married at this stage in her adolescence that ran away to the city of Arusha, where she got a job as a house girl. Amani, all the girls above and all others who passed the exam are now in secondary school. Amani means ‘Peace’ in Swahili, and she is now at peace, able to fulfil her dream of education. Many thanks for all of your support enabling this work.